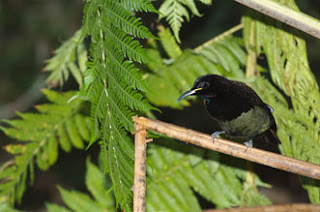 Victoria’s Riflebird, Ptiloris victoriae, (named for Queen Victoria) is one of three Riflebirds occurring in Australia. They are so named because it is said the “call”, such as it is, sounds like a discharging rifle. To me it sounds more like a loud squawk of the Spotted Catbird. The birds are primarily fruit-eaters and visit the bird feeder often where they eat bananas, raisins and other fruits in season. 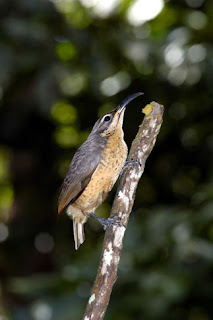 The decurved beak is used to pry insects from tight places. Adult males are spectacular with their black iridescent plumage that glistens metallic green and blue when they fly. The feathers produce a peculiar sound when they fly reminiscent of the crumpling of cellophane. Their courtship displays are elaborate as are those of their northern cousins and they sometimes display in the vegetation adjacent to the feeder. The birds are not monogamous. The nest is a small bowl and is often decorated with snake skins. Females and subadult males are brown streaked. These photos were taken at our feeder by noted wildlife photographer Gary Wilson. Everett, M. 1987. Birds of Paradise. Chartwell Books, Secausus, New Jersey (Reprinted). 144 Pp.